People in China could soon be banned from boarding planes and trains by the Chinese regime’s “social credit system,” an experimental design that international observers have speculated will be the next step in China’s transformation into a total surveillance state. The regime’s National Development and Reform Commission rolled out new regulations regarding travel on March 16, according to Reuters. The commission, a regulatory agency controlling the Chinese economy, targeted commercial flight passengers in one statement and train riders in another. 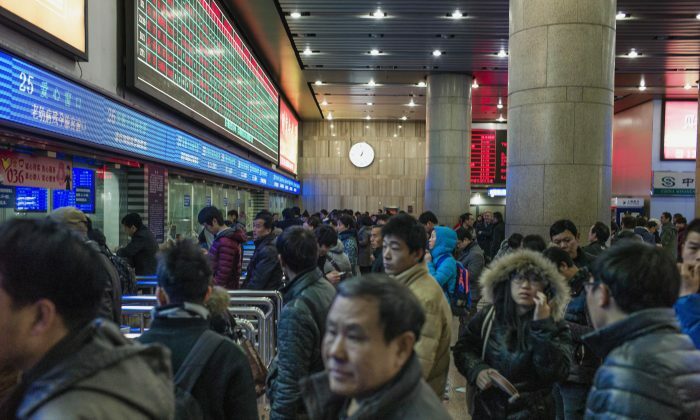 The new rules stipulate that starting May 1, Chinese citizens who have been recorded for a variety of misdeeds could find themselves banned from flying or taking trains. “Spreading false information about terrorism,” “causing trouble on flights,” using expired tickets, and smoking on trains are among the acts that would get one banned from planes and trains altogether. The charge of “spreading false information about terrorism” is clearly meant to allow the regime to punish disallowed political speech. Those who have failed to enroll in China’s social security fund, and those who have been found to be exploiting the social security system will also be put on the no-fly list, but will be allowed to ride on trains, though limited to lower class seats. The commission’s statements also made specific reference to the “social credit system” and said that the new rules are consistent with the directives issued by Chinese Communist Party’s 19th Party Congress last year. The nature and exact implementation of the regime’s “social credit system” still remains opaque, although it has been the subject of much speculation for years. With the new regulations, the regime is beginning to implement a system that many international observers have panned as a step in China’s transformation into a total surveillance state. Many have anticipated that the system will eventually rate citizens based on everything they say and do, and those with a low social credit ranking could find themselves being denied basic public services or even a job or housing. Besides recording minor infractions like jaywalking or smoking in public, the system could also record and punish citizens for making dissenting speeches. In compliance with the regime’s directives, China’s major social media sites have already implemented a similar system to muffle users who say what is prohibited. Weibo, China’s equivalent of Twitter, has already rolled out a “credit score” system to measure how much a user is compliant with the site’s speech policies.